On May 17, 1673 two French explorers (Father Jacques "Pete" Marquette, a Jesuit missionary from France and Louis Joliet, a French-Canadian fur trader and explorer) were chosen by Frontenac, Governor of New France, to lead an expedition to find the direction and mouth of the Mississippi River, known by the natives as Messipi "The Great Water". Despite sharing the same goal of finding the river, the two leaders' ambitions were different. Joliet, an experienced mapmaker and geographer was focused on finding the mouth of the Mississippi. Marquette wanted to spread the word of God among the people he encountered along the way. They were the first non-natives to explore and map the Mississippi River and they claimed the Middle Mississippi River Valley for the French, naming this area Les Riverages de Fer, or Iron Banks, believing the reddish-brown color of the banks was due to the presence of iron ore in the soil. According to Dr. John Robertson Professor Emeritus UKCSS, Father Marquette listed in his journal that they had entered "mosquito country". Also according to Dr. Robertson, "Father Marquette climbed the river banks to see just what substance the banks were made of. He recorded in his journal that he stuck his paddle into the loose soil and it stained the blade of the paddle so deeply that the iron color could still be seen five days after paddling down the Mississippi." The town's name of Iron Banks was changed to Columbus (in honor of Christopher Columbus, the Italian explorer) in 1820. 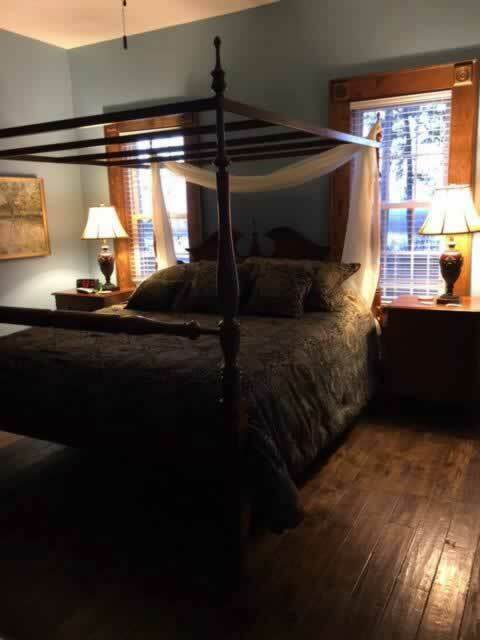 $110 per night ~ Spacious upstairs room with private bathroom w/shower/tub combo, king size bed, TV and limited river views.